When you’re Santa Claus, you get a lot of predictable Christmas wishes when kids sit upon your lap at the mall — dolls, video games, swing-sets … maybe even a pony. Simple enough. But what do you do when 7-year-old K’Hairi climbs onto your lap? K’Hairi, who suffers from sickle-cell disease in addition to sleep apnea and asthma, has asked Santa the last few years for something rather difficult to put in his sleigh — even tougher than a pony. He asked for his mother to have a nice house. 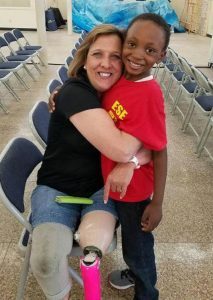 Even as his mother Carla Ross, a U.S. Army veteran attempted to rein in those high hopes, K’Hairi insisted that dreams do come true. On Wednesday, in West Point, Georgia, K’Hairi won that argument with no help from Santa but with the help of several partners in the area. Hundreds of student volunteers from Point University packed downtown West Point, Georgia, to assemble wall packages provided by CrossRoads Missions — walls that will be raised during a two-week Chattahoochee Fuller Center Project build in June. 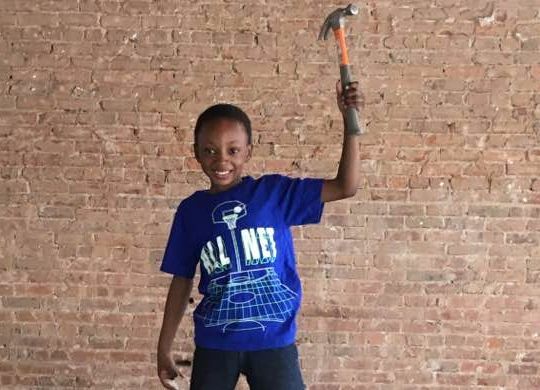 A grant from Home Depot is funding the build that will be led by frequent volunteer construction leaders Tim DuBois and Charlie Thell of Minnesota. “That K’Hairi has always wished this for his mom just makes it even more wonderful,” said Kim Roberts, Executive Director of the Chattahoochee Fuller Center Project, who said the build will begin on June 12. Point University, a Christian university based in downtown West Point, used the wall assembly day as part of its Impact Day that encourages community service and putting faith into action. On Tuesday, Batson-Cook Construction sent a team of volunteers to do preliminary cutting and set up for the assembly. Trustees from the local jail will provide most of the labor for the two-week build, an idea promoted by DuBois and Thell, who saw several trustees in action during the fall’s Millard Fuller Legacy Build in nearby Valley, Ala.
Thankyou all so much I am in tears of joy right now. K’Hairi is still overwhelmed. The impact of my day!! !